La República Argentina es un país independiente de América, organizado como una república representativa y federal. Por su extensión, es el segundo Estado de América del Sur y el octavo en todo el planeta, tanto si se considera sólo la superficie continental americana sujeta a su soberanía efectiva, de 2.780.400 km², como si se incluyen los 15.277 km² de las Islas Malvinas, Georgias del Sur, Sándwich del Sur y Aurora administradas por el Reino Unido de la Gran Bretaña pero consideradas por Argentina como parte integral de su territorio y los 965.597 km² del área antártica reclamada por Argentina al sur del paralelo 60° S, denominada Antártida Argentina y que incluye a las islas Orcadas del Sur y Shetland del Sur. Con las áreas en disputa, la superficie total se eleva a 3.761.274 km². Su territorio continental americano limita al norte con Bolivia y Paraguay, al nordeste con Brasil, al este con Uruguay y el Océano Atlántico y al sur y al oeste con Chile. The Argentine Republic is a country in southern South America. It ranks second in land area in South America, and eighth in the world. 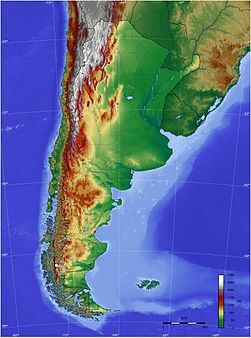 Argentina occupies a continental surface area of 2,766,890 km² (1,078,000 sq mi) between the Andes mountain range in the west and the southern Atlantic Ocean in the east and south. It is bordered by ► Paraguay and ► Bolivia in the north, ► Brazil and ► Uruguay in the northeast, and ► Chile in the west and south. The country claims the British controlled territories of the ► Falkland Islands (Spanish: Islas Malvinas) and ► South Georgia and the South Sandwich Islands. Under the name of Argentine Antarctica, it claims 969,464 km² (374,312 sq mi) of► Antarctica, overlapping other claims made by Chile and the United Kingdom. The country is formally called the Argentine Republic (Spanish: República Argentina, IPA [reˈpuβlika aɾxenˈtina]). For many legal purposes, Nación Argentina (Argentine Nation) is used. More images Argentina - Argentina (Category). This section holds a short summary of the history of the area of present-day Argentina, illustrated with maps, including historical maps of former countries and empires that included present-day Argentina. Europeans arrive in present-day Argentina in 1502 with the voyage of Amerigo Vespucci, and later in 1512 Juan Díaz de Solís arrives to the River Plate (Río de la Plata) seeking a passage to the South Sea (Pacific Ocean). Thinking that is not a river but rather an ocean, he calls it Sweet Sea ("Mar Dulce") because of the taste of its waters. The area is annexed to the Spanish Vice-Royality of Peru in 1534. Spain tries to establish a permanent colony on the site of Buenos Aires in 1536, but it is later abandoned due to the constant conflicts with the so far peaceful local indians and the consequent famine. In 1580, settlers from Asunción of Paraguay headed by Juan de Garay establish a permanent town called City of the Most Holy Trinity and Port of Our Laby of Buenos Ayres ("Ciudad de la Santísima Trinidad y Puerto de Santa María de los Buenos Ayres"), although initial settlement is controlled from Peru. This map shows the location of the Captaincy General of Chile inside Peru, which Buenos Aires limited to. The area of Argentina was divided between the governancy of Tucuman and the governancy of Guayra, later on called Rio de la Plata. After a century, the territory of the later was divided in the governancies of Paraguay and of Rio de la Plata, this one with its seat of government in Buenos Aires. Spain further integrates Argentinean territory into its reformation of the empire by establishing the Viceroyalty of the Río de la Plata in 1776. Rio de la Plata declares independence from Spain in 1816 in the Congress of Tucumán as the United Provinces in South America. Although the country becomes independent, this does not mean that it is a true union. Especially the northwest provinces resist central authority. The years spreading from 1820 to 1853 find the provinces in almost permanent civil war between unitarist and federalist. 1826 is a markstone in disunification when a new unitarian constitution is written for the Republic of the United Provinces of the Rio de la Plata. After Governor Juan Manuel de Rosas is defeated by a coaligation in the Battle of Caseros, the civil war is ended. The country is worldwide known by then as the Argentine Confederation, later renamed into Argentine Republic. The constitution of 1853 accepts all the names so far given to the country as its official name, though for all official documents the name Argentine Nation (Nación Argentina) is preferred. For maps on the Falkland war, see the Atlas of the Falkland Islands.